Berea Grit is sandstone which forms the middle layer of the Waverly group of geological rock formations in Ohio, outcropping in the northern part of the state. Berea Grit is sandwiched between two other layers of stone: below it lies red Bedford limestone, while immediately above it is Berea Shale and Cuyahoga Shale, each about 10 or 15 feet thick. Between the shale and the grit is a coat of glacial drift a few inches thick containing ancient fossils, shells, and bones. The rock formation of which the Berea quarries are a part extends from Central Ohio east to Pennsylvania and West Virginia and south into Kentucky. Berea Grit is of Mississipian Age origin (it has been 300 million years since the beginning of this age). This sandstone in Ohio is found east of a line drawn from Erie County in the north to Adams County in the south. Significantly, some of the best sandstone in the United States lies beneath Cuyahoga and Lorain counties. The sandstone John Baldwin and his neighbors found in the 1830s was very near the surface in Berea, although as the stone formation moves south it dips at a rate of twenty feet to the mile. (In fact, the first sandstone here was seen by man because over the years water from Rocky River had removed the covering layers and had exposed the valuable stone at the surface.) Because of its large sand grains, geologists believe that Berea Grit probably was deposited near the shore of an ancient lake. 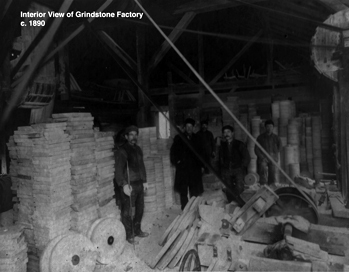 The sandstone found in Berea — the largest sandstone quarries in the world — is unique in that the grain runs the long way of the blocks, making it easier to quarry and more durable in its uses. Berea Grit also is famous for its evenness in texture and color. It is free from impurities that would lessen its value in the commercial market. Analyses of Berea Sandstone show that it is composed of at least 93 percent silica, four percent alumina, plus other trace elements, and weighs 140 pounds per cubic foot. Once sandstone is removed from the ground and “cured” (that is, its water or “sap” is dried out) it becomes impervious to water, salt, or chemicals, making it superior to other types of building stone or man-made substances. The unique quality of sandstone as a grinding stone is that as the outer surface grows dull with use, the worn particles break off, constantly exposing a fresh and sharp surface for sharpening tools. Much work had to be done before the desired stone was reached. 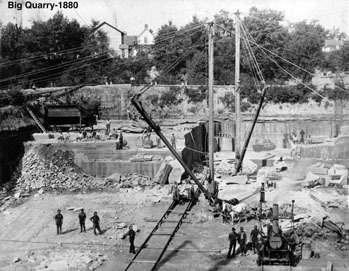 In the quarries Baldwin founded in the south of Berea, for example, the valuable sandstone was covered by four feet of earth, a foot of useless “black rock,” and 21 feet of shale. The “Berea Ten Foot Sheet” (or Layer), by far the most valuable of all the area’s building stone, was the third layer down the southern quarries. This grayish-white sandstone was free from pebbles and was found in sheets varying in thickness from six inches to ten feet. These layers usually had a good bed-seam, meaning they could be quarried separately and with regard to their intended use. 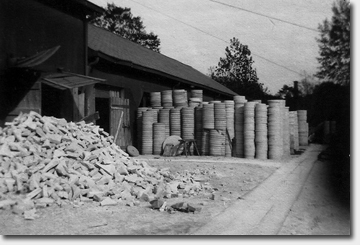 The best layers of Berea Grit were saved for making world-famous grindstones which required a smooth and even texture, neither too soft nor too hard. These layers also had to be completely free from cracks, flaws, foreign objects, or hard spots. Furthermore, stones to be shaped into grindstones or whetstones had to be easily split into the desired sizes. Other less suitable grades of sandstone were used for building purposes. The thinner strata of sandstone, if removed in large slabs, were sawed into paving blocks and flagging for sidewalks and driveways. Text and images from the book Then There Was None © 1996 by Mickey Sego, all rights reserved. Available at our Gift Shop.